our planet is home to a large number of different types of interesting animals. For example, the Koala is considered very cute and attractive. On most images animal looks like a nice and cute “bear”, so he makes many people smile. Try and figure out how to draw a Koala, putting in the work part of his soul. Work on the figure of the animal can be a good test for experienced masters and emerging artists. 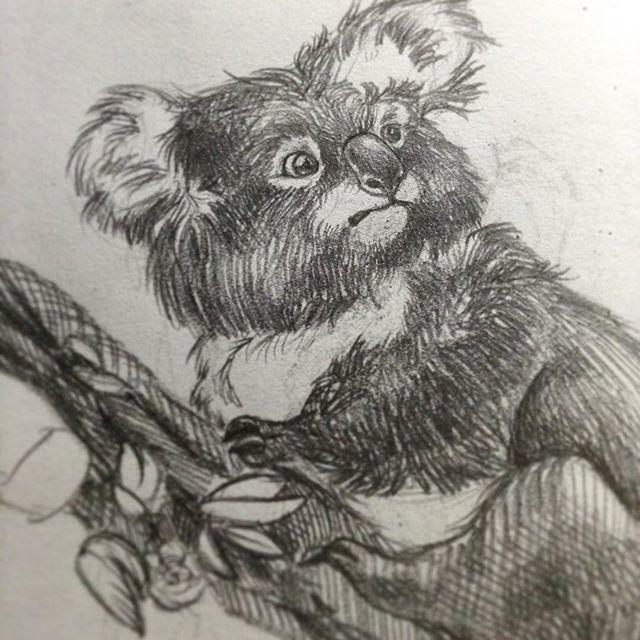 How to draw a Koala with a pencil in stages? a Large part of his life, holds a Koala in the trees. So often a figure runs in the background, similar to the habitat of the animal. Draw the body in the form of a large oval. Head koalas draw one long oval, slightly superimposing it on top of the trunk. Top of the head of the Koala needs a little narrow. Finish the ears oval in shape, and then big eyes, leaving a white spot on the pupil. Carefully draw the eyelids of the animal. Draw on the face, large nose, and then give the Koala smile a beautiful bend of the line. Draw fluffy cheeks, and emphasize their shadows. 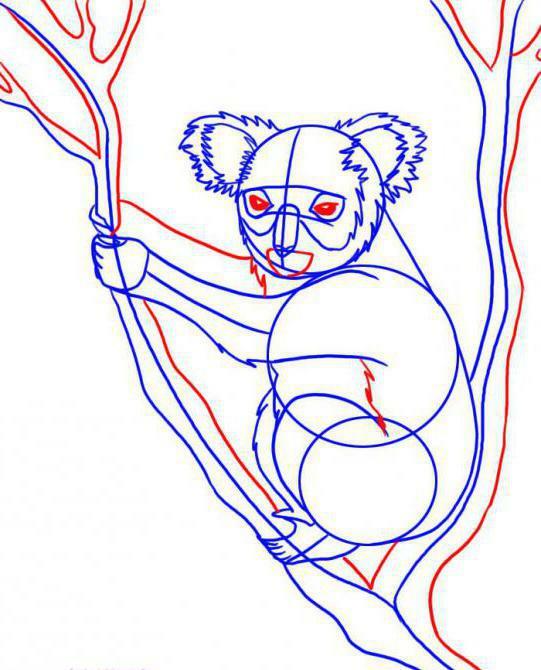 Draw the legs through which a Koala clings to a tree trunk. Highlight the curve of the back. Then erase unnecessary lines and make a smooth transition to the paws of the animal. Erase the contour of the body of the animal, which intersects with lines of the tree. 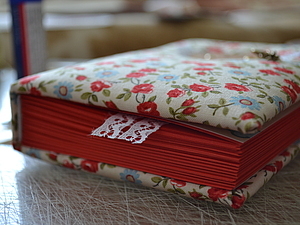 Because of this you will be able to give natural pattern. Draw the lower limbs - they end with three fingers. Draw lines on the ears, passing the bend of the ears. Raschertite smooth lines through the body for transmission of fluffy structure. Draw the wool smooth and soft movements. All unnecessary lines gently wipe with an eraser. drawing koalas are almost complete. Upon completion you will have a complete understanding of how to draw a Koala quickly and easily. And, of course, is to be in a good mood and patience. 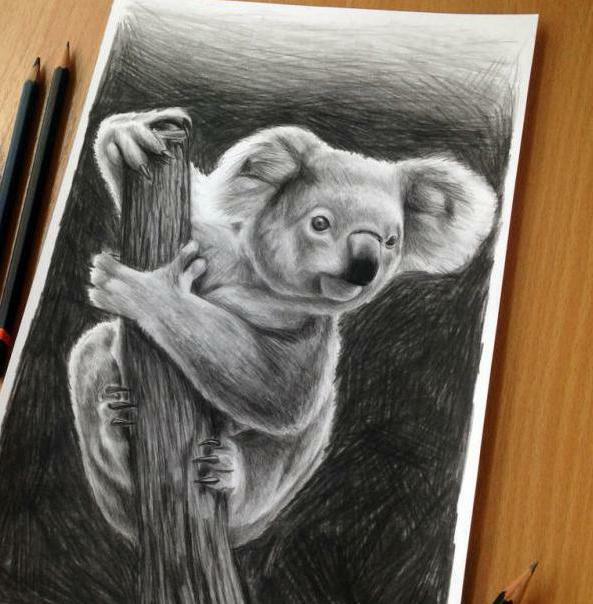 do Not push hard on the pencil, because the Koala for its fur has no clear contours. In addition, the figure will be continuously updated, and the bold lines difficult to remove. Wool applied with short strokes. Of course, some lines can intersect, but you need to ensure that they were applied in the same direction. Pay attention to the transition from shadow to light. 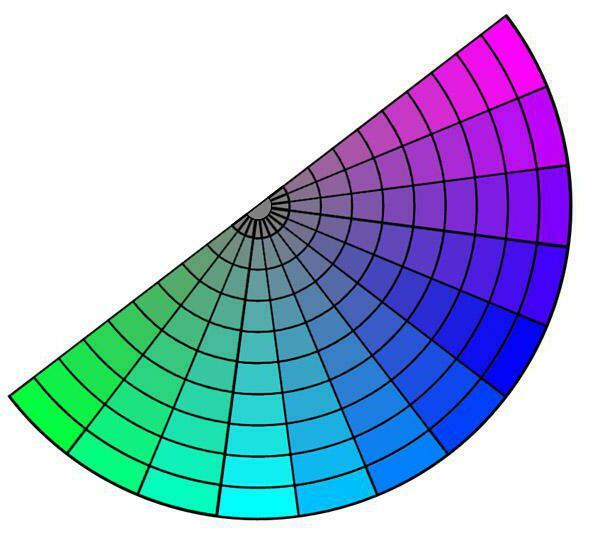 to achieve a smooth transition of colors, you can shade a drawing with a piece of paper. 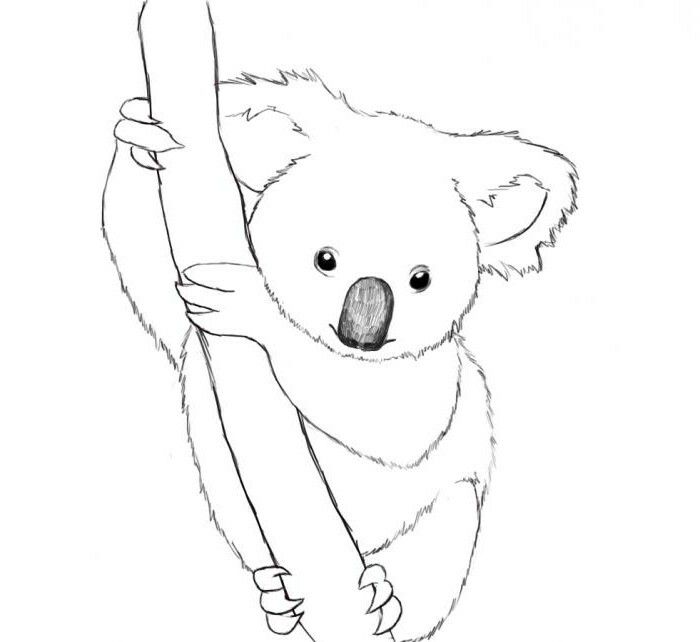 There are several different way of explaining how to draw a Koala step by step, without difficulties. Draw the contours of the body “bears”. 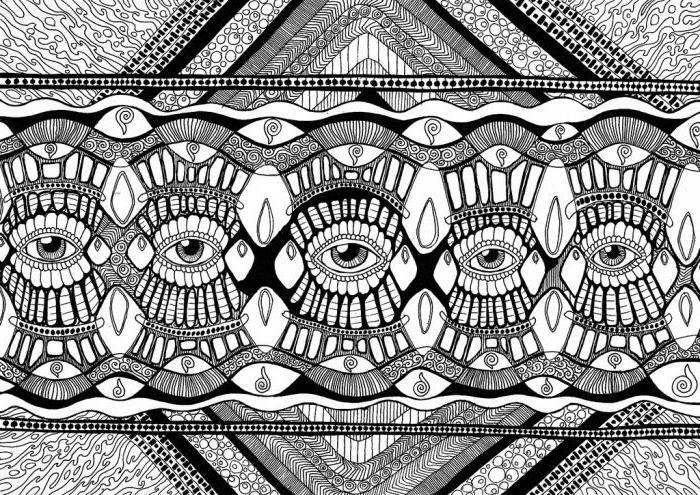 To start, draw three circles superimposed on one another. The smallest – the head, average, a little more – the upper torso and the lower part is the biggest. At this stage it is important to observe the proportions of the body of the animal, because it will directly affect the realism of the picture. Draw the contours of the upper legs. By passing the curvature of the case go smoothly to the hind limbs. Also finish a face: two ears, small eyes and a big nose. Later they will turn into a nice "face" koalas, and yet will be just a marking. To the bottom of the legs add four small circles. Next, you will continue work on these elements. Now connect the contours of the front legs between them. But keep in mind that the left foot Koala clings to a tree, respectively, it should be slightly bent. Koala is retained, and the lower legs. Therefore, their contours should represent approximately the same level. Give the lugs shaggy by drawing wavy lines in various lengths. Draw a couple of branches. One branch, on which sits a Koala, and second at which the animal is kept. Then draw the eyes, using the technique from the previous description. To achieve the desired visual effect, draw glare. Also use the transfer of light and shade to give volume to the nose of a Koala. If you draw only in pencil, it is necessary to put the shadows in order to make the figure more voluminous. If desired, you can paint around the image of a Koala landscape that will give the painting more realism. Complete picture can be left unchanged without an image of nature. To make the color in the painting use bright colored pencils. It is also possible to decorate the picture using real branches or dry grass. This option looks very interesting and original. Success and good mood in the work depend on you. Most importantly, make the whole process fun. Cool colors. How to identify dark and bright, cold colors? How to choose your cool tone?